Condition, smooth and add serious shine to your lacklustre hair! 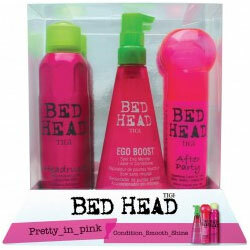 This great value TIGI Bed Head Pretty In Pink Pack will save you �18.40 and leave you with lustrous locks that will get you noticed. Banish bad hair days and welcome goddess-like hair! Enriched with vitamins and using TIGI Bed Head�s advanced technology, this great value Pretty In Pink Pack provides the ultimate combination of haircare products for the all night party chick! Ensure your hair has shine, body and life and shows no signs of the round the clock partying that you enjoy so much! TIGI Bed Head Ego Boost � 200ml Apply Ego Boost Leave-In Conditioner to towel dried hair. It strengthens, detangles and moisturises hair whilst minimising the effects of split ends.